Walmart is taking the plunge and getting into the use games market. This has been all over the internet for the last week or so. To make sure gamers know they have been offering some decent trade in bonuses and have an online TIV checker. This brings the speculative questions up, should gamers be trading to Walmart? What will this mean for Gamestop and other outfits? Are there better options out there? Forbes ran this article which can only mean other outlets are running their version as well, and by now the average Walmart shopper knows. 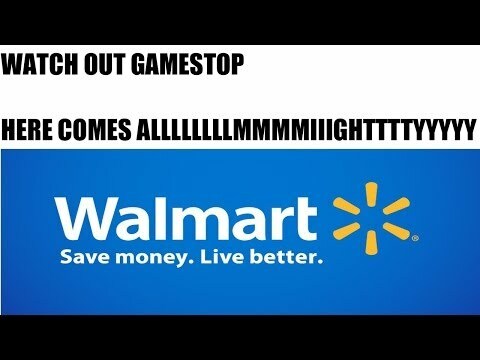 Should gamers be trading in their games to Walmart? Well outside of Gamestop, in my experience trading to Best Buy and Target is a little time consuming but not a hassle. I envision Walmart being a giant cluster. Store associates not caring or knowing what they are doing. Promos being missed. I would rather put up with Gamestop pre-order, credit card banter during trade-in than Walmart’s ineffectiveness. But for some gamers this might be the only option. The TIV checker is nice, and Walmart is offering 50% bonus toward COD: Advanced Warfare limit 2 games per customer. They might have learned something since the last NBA 2K15 promo they ran. They are offering $100 TIV bonus limit two games toward a PlayStation 4. All the details and fine print are here. But couldn't people just do multiple transactions and get around this? People on Cheapassgamer.com have been reporting this working. Walmart entering this market will put the squeeze on Gamestop and Best Buy I would think. This means they may have to offer better trade-in bonuses or make the trade-in experience better. Best Buy has been offering many deals on their Gamer’s Club Unlocked Membership. Two years for $30 and this gets gamer's 20% off new games and other bonuses. There are still better options out there. Amazon is a great place to trade games and sites like 99Gamers where gamers are trading their titles for virtual currency is another great feasible option.